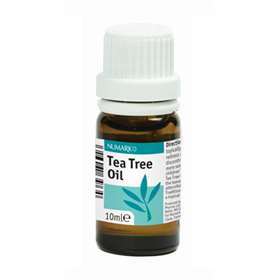 Numark Tea Tree Oil - a natural antiseptic. Tea Tree is a pure oil culled from the leaves of a tree (Melaleuca Alternifolie), native to Australia. Traditionally Tea Tree Oil has been used as a topical agent for the skin. Apply topically to the skin. If irritation, redness or swelling occurs, discontinue use imediately. For more sensitive skins, particularily children's skin, dilute in a little water. Product code: 3755204 Price: £1.59 (incl VAT) Sorry, this item is currently unavailable. Click here to receive notification when this product comes back into stock.